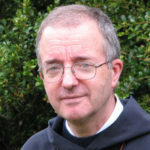 Jean-Pierre Longeat, former abbot of Saint-Martin – Ligugé (France) is born in 1953. He entered the abbey of Liguge in 1975. He was guest-master and novice-master. He was elected abbot of his monastery in 1990. Jean-Pierre Longeat is musician and he likes the dialogue with the world of art and culture. His community is very involved in a deep dialogue with the artists. He was during six years President of the Conference of religious life in France (about 500 religious congregations and 30 000 members). He is now President of AIM (Alliance for international monasticism) sustaining the young foundations of the Benedictine family all around the world. This organization is 55 years old. It is a structure which gives the possibility for different spheres to meet and work together.